“In Frederic Church’s Ombra: Design in Conversation with Nature” showcases multimedia design concepts and installations, developed by leading architects and select artists. As Guest Curator, Barry Bergdoll (of Columbia University and the Museum of Modern Art) invited a group of today’s most exploratory architects to respond to the transitional outdoor rooms at Olana that are so essential to the original 19th century design of Olana’s Main House. These architects were asked to examine assumptions about the relationship of architecture and landscape at Olana, as well as to explore the Main House’s transition to the surrounding natural environment, particularly in our time of climactic and environmental change. The resulting exhibition combines hand-drawn sketches, painted renderings, three-dimensional models, and video and computer animations. 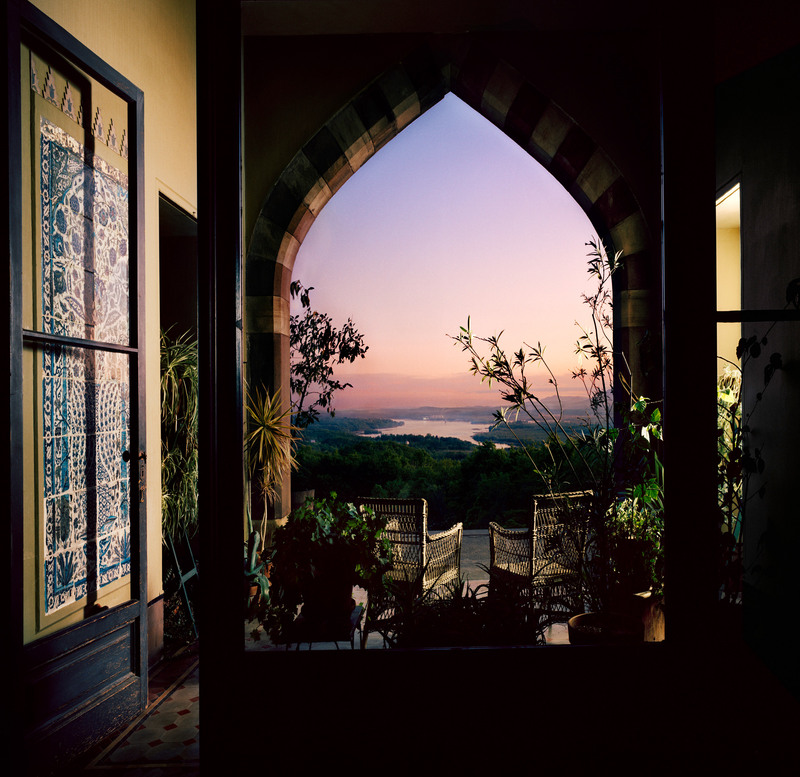 The first phase of Olana’s main house was designed collaboratively by the artist Frederic Church and the architect Calvert Vaux, and Olana’s main house and its 250-acre landscape were designed to incorporate vast Hudson Valley views. A key space in Olana’s main house design is the ‘Ombra’, an outdoor room which is a transitional zone between the central Court Hall and the surrounding landscape. This and the other transitional spaces at Olana (the Piazza, Round Veranda, and Bell Tower) have been unfurnished and not fully examined until now. In the collaborative spirit of Calvert Vaux and Frederic Church, several architects in the exhibition have paired with visual artists and other designers to develop their concepts. The exhibition features the work of Steven Holl (Steven Holl Architects), Tatiana Bilbao (Tatiana Bilbao Estudio) with artist Arantxa Solis, Stan Allen (SSA/Stan Allen Architect), Amale Andraos and Dan Wood (WORKac), Jennifer Sage and Peter Coombe (Sage and Coombe Architects) with artist Chris Doyle, Mario Gooden (Huff + Gooden) with Walter Hood (Hood Design Studio). Exhibition design is provided by Spacesmith Architects, and graphic design is by Dylan Jhirad. Barry Bergdoll is Meyer Schapiro Professor of Art History at Columbia University and a curator in the Department of Architecture and Design at the Museum of Modern Art, New York. A specialist in the history of modern architecture, he has curated numerous exhibitions at MoMA, the Canadian Centre for Architecture, the Musée d’Orsay, and other venues, including Mies In Berlin (2001), Bauhaus 1919–1933: Workshops for Modernity (2009-2010), Latin America in Construction: Architecture 1955-1980 (2015) and Frank Lloyd Wright at 150: Unpacking the Archive(2017). He is the author most recently of Marcel Breuer: Building Global Institutions (2017), and many other publications including La structure mise en lumière – Henri Labrouste (1801-1875) (2012), European Architecture 1750-1890 (2000). Exhibition design by Spacesmith Architects (spacesmith.com). Graphic design by Dylan Jhirad. Sage and Coombe Architects is located in New York City and led by Jennifer Sage FAIA and Peter Coombe AIA. Their work is based on the belief that there are many solutions to any design problem and that the best work emerges from a collaboration of forces. Drawing inspiration from the specific site and culture of the project, there is always room for innovation and of course, humor. Their work has included the design of the Noguchi Museum renovation, the Bronx River Art Center, Smack Mellon, the Rockaways after Superstorm Sandy, as well as work for numerous academic, cultural and civic institutions, both public and private. Currently, their redesign of a key piece of public space in downtown Newark is nearing completion. Sage and Coombe was selected multiple times for the Design Excellence initiatives for public work commissioned under the Bloomberg administration. Their clients include the Maplewood Memorial Library, the New York Public Library, the FDNY, the NYC Economic Development Corporation, the Mayor’s Office of the City of New York, the NYC Department of Cultural Affairs, the NYC Department of Environmental Protection, the New York State Parks Department, and the New York State Department of Environmental Conservation, the City of Newark, and the Greater Newark Conservancy. This exhibition has been generously funded by support to The Olana Partnership for the Novak-Ferber Exhibitions Fund.